In January 2018 I was hired as a Regional EHS Manager by Enviva after a nearly two-year search for full-time employment. This journey has been quite a learning experience, and I would like to share some lessons learned from my 30 years in industrial health and safety. First and foremost, I continue to advocate for the value of being a positive influence in life and, in particular, in the workplace. One of the benefits of being a “senior” professional is that I’ve lived a full spectrum of experiences. Since coming to work for Enviva, I’ve had to expand my knowledge in a sector of industry that I knew nothing about—wood pellet manufacturing for power plants in the U.K., EU, and Asia. Enviva is a leading global energy company specializing in sustainable wood biomass—and it’s the world’s largest producer of wood pellets, which provide sustainable, low carbon heat and power, replacing fossil fuels. Enviva owns and operates seven manufacturing plants in five states in the Southeast United States. These are 24/7 operations, and the men and women who work in these plants work 12-hour shifts with plenty of opportunities for overtime. It is hard work. Seasoned professionals have learned the detrimental impacts of low morale on productivity and safety. True leaders have learned a key lesson: If you take care of your people, they will take care of you. As a seasoned health and safety professional, I’ve learned not only to provide constructive feedback when employees are not strictly adhering to health and safety practices and policies, but also to provide positive reinforcement when employees are performing to the organization’s expectations. Too many times, employees hear from leaders only when they are underperforming. An experienced professional can be invaluable in shaping a leadership team’s approach to developing a culture that values the contributions of individuals for the success of the entire team. Whether an organization has an Operations Management System, Integrated Management System, or Operational Excellence Management System, a critical element is developing and sustaining a culture that underpins operational excellence by valuing individual contributors as key stakeholders. Over my three decades in industry, it has been my experience that front-line workers often feel undervalued simply because leaders will pass them in the workplace when they’re hot, sweaty, tired, or working in a difficult situation and not take the time to say, “Thank you for what you’re doing to make our company successful. We appreciate you!” Those 14 words cost nothing. As Regional EHS Managers, we typically are not in the middle of the operational battle of the day and can be a steady, positive influence across a plant, factory, rig, platform, or office because we have both the perspective and the experience to see the entire field. Experienced leaders also recognize that when the heat of battle is over, it is important to take time to give thanks to those who did the work. Most recently, I did this with the support of Enviva’s leadership by cooking authentic chicken and sausage gumbo at my Mid-Atlantic plants and port. The value was immeasurable. We took time between Thanksgiving and Christmas to celebrate a year of hard work, dedication, and safe performance and to say thank you. We posted photos of workers, recognized safety committee members, discussed safety initiatives and operational discipline opportunities employees were interested in, and shared humorous memories of 2018. Members of the leadership team at each site helped to serve the meal. This simple act reinforced the importance of maintaining healthy relationships by valuing each member of the team. In today’s fast-paced world, employers should recognize that workers with decades of experience offer value in five key areas. Several years ago, I had a conversation with a good friend and colleague who was retiring from a major oil company after a 30-year career. He expressed his observation (and frustration) that within that organization, “If you can Google it, you can be a manager.” Those of us who have had the benefit of years of experience can bring it to the table in the development and delivery of value-added training. The best part about this is that we are already part of the organizations we serve. We just need to be tapped for our knowledge, skills, information, and abilities. Most of us who have been industrial health and safety professionals for several decades were formally trained. I have been a member of several professional organizations where I both learned and shared knowledge and best practices between organizations. I also attended development courses to attain professional certifications, including colleges, universities, vocational-technical schools, professional organizations’ sponsored training, and company sponsored/third-party training. Teachers and subject matter experts have taught me everything from industrial hygiene to decontamination protocols. Additionally, I have had the years of experience to see and (unfortunately) be involved in incident investigations where I learned lessons that I carry with me and can apply today. This formal training, education, and experience cannot be replicated with Google. Perhaps one of the biggest contributions an organization can make is in the development and mentoring of young professionals. Across industry today, there is a rapidly increasing upward progression of young women and men with limited “time in grade” experience. These people will be leaders in their organizations in the future. They need and deserve the best information, resources, and professional development their organizations can give them. Formalizing this development can provide for an evergreen process that is self-sustaining and values knowledge and experience within the company. An organization’s senior resources are a rich pool of knowledge and talent. Remember encyclopedias? They have been replaced with the Internet, with unlimited amounts of data and information at a simple keystroke. But organizations face problems that Google and Wikipedia have not yet found the data to solve. Whether these are mechanical breakdowns, human errors, or system failures, an organization’s senior resources have probably seen, heard, or experienced similar challenges. Development of corporate think tanks, SWAT teams, or technical authorities, for example, can save organizations from these breakdowns and provide insight and experience on how to correct them and implement long-term, sustainable solutions. By now, all of us have seen the Together Everyone Accomplishes More (TEAM) acronym. But, how many of us have the knowledge and experience to put together real-time, practical approaches and initiatives to create this environment? According to Dr. W. Edward Deming, who offered 14 points for quality management, when individuals understand what the expectations are; how they can meet and deliver these expectations; the value of this effort; and, most important, feel valued as key stakeholders, they will invest themselves in the success of the enterprise. When all of these factors are working, 97 percent of the workforce will deliver to those expectations provided that the system itself works as designed. When there are problems with productivity, maintenance, and operational efficiency, these are the result of poorly designed systems. Developing TEAM approaches and systems can help to identify and solve management system deficiencies. Who is best situated to identify these system failures? Your front-line employees. They talk about them every day. How do you tap into their knowledge? Provided that an organization’s management values and recognizes the efforts of their employees, this is one of the most powerful ways to engage and harness the knowledge and energy of a workforce. It gives them a voice and the opportunity to contribute. 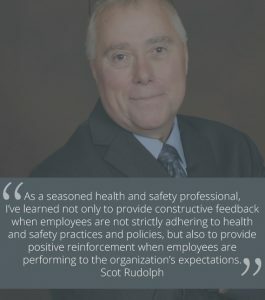 Remember that safety and operational excellence are not mutually exclusive, and engagement in an organization’s health and safety process connects directly to operational efficiency. Formal feedback can take many forms—operational discipline discussions, 360-degree feedback forums, electronic or anonymous surveys, town hall meetings, or employee engagement workshops. An organization that places value on the knowledge and opinions of their employees will receive real data that is not written in any policy, practice, or procedure. A mature organization is not only receptive to this information but actively seeks to hear it. When an organization moves from a blame or win/lose culture to a team approach, everyone becomes engaged and seeks ways for the team to win. Have you ever watched a high-performing sports team where an individual has a bad play, mental lapse, or makes a mistake? What do his or her teammates do after the mistake? Teammates take the mistake on their shoulders and maintain cohesiveness. When a team begins to openly blame individuals for mistakes, most often that team falls apart and loses the game. Sure, you’ll get some sour grapes, but the wine made from the quality feedback will be of the highest quality and will allow for the growth of the company. Thank you for taking time to read my musings and personal and professional lessons. If these can help save one more occupational injury, they have been successful.